Researchers from the European Graphene Flagship* have developed a new microelectrode array neural probe based on graphene field-effect transistors (FETs) for recording brain activity at high resolution while maintaining excellent signal-to-noise ratio (quality). The new neural probe could lay the foundation for a future generation of in vivo neural recording implants, for patients with epilepsy, for example, and for disorders that affect brain function and motor control, the researchers suggest. It could possibly play a role in Elon Musk’s just-announced Neuralink “neural lace” research project. Neural activity is measured by detecting the electric fields generated when neurons fire. These fields are highly localized, so ultra-small measuring devices that can be densely packed are required for accurate brain readings. In an experiment with rats, the researchers used the new devices to record brain activity during sleep and in response to visual light stimulation. The graphene transistor probes showed good spatial discrimination (identifying specific locations) of the brain activity and outperformed state-of-the-art platinum electrode arrays, with higher signal amplification and a better signal-to-noise performance when scaled down to very small sizes. That means the graphene transistor probes can be more densely packed and at higher resolution, features that are vital for precision mapping of brain activity. And since the probes have transistor amplifiers built in, they remove the need for the separate pre-amplification required with metal electrodes. Neural probes are placed directly on the surface of the brain, so safety is important. The researchers determined that the flexible graphene-based probes are non-toxic, did not induce any significant inflammation, and are long-lasting. “Graphene neural interfaces have shown already a great potential, but we have to improve on the yield and homogeneity of the device production in order to advance towards a real technology,” said Jose Antonio Garrido, who led the research at the Catalan Institute of Nanoscience and Nanotechnology in Spain. * With a budget of €1 billion, the Graphene Flagship consortium consists of more than 150 academic and industrial research groups in 23 countries. Launched in 2013, the goal is to take graphene from the realm of academic laboratories into European society within 10 years. The research was a collaborative effort involving Flagship partners Technical University of Munich (TU Munich. Germany), Institut d’Investigacions Biomèdiques August Pi i Sunyer (IDIBAPS, Spain), Spanish National Research Council (CSIC, Spain), The Biomedical Research Networking Center in Bioengineering, Biomaterials and Nanomedicine (CIBER-BBN, Spain) and the Catalan Institute of Nanoscience and Nanotechnology (ICN2, Spain). ** “Using multielectrode arrays for high-density recordings presents important drawbacks. Since the electrode impedance and noise are inversely proportional to the electrode size, a trade-off between spatial resolution and signal-to-noise ratio has to be made. Further, the very small voltages of the recorded signals are highly susceptible to noise in the standard electrode configuration. [That requires preamplification, which means] the fabrication complexity is significantly increased and the additional electrical components required for the voltage-to-current conversion limit the integration density. … Metal-oxide-semiconductor field-effect transistors (MOSFETs) where the gate metal is replaced with an electrolyte and an electrode, referred to as “solution-gated field-effect transistors (SGFETs) or electrolyte-gated field-effect transistors, can be exposed directly to neurons and be used to record action potentials with high fidelity. … Although the potential of graphene-based SGFET technology has been suggested in in vitro studies, so far no in vivo confirmation has been demonstrated. Here we present the fabrication of flexible arrays of graphene SGFETs and demonstrate in vivo mapping of spontaneous slow waves, as well as visually evoked and pre-epileptic activity in the rat.” — Benno M. Blaschke et al./2D Mater. Establishing a reliable communication interface between the brain and electronic devices is of paramount importance for exploiting the full potential of neural prostheses. Current microelectrode technologies for recording electrical activity, however, evidence important shortcomings, e.g. challenging high density integration. Solution-gated field-effect transistors (SGFETs), on the other hand, could overcome these shortcomings if a suitable transistor material were available. Graphene is particularly attractive due to its biocompatibility, chemical stability, flexibility, low intrinsic electronic noise and high charge carrier mobilities. Here, we report on the use of an array of flexible graphene SGFETs for recording spontaneous slow waves, as well as visually evoked and also pre-epileptic activity in vivo in rats. 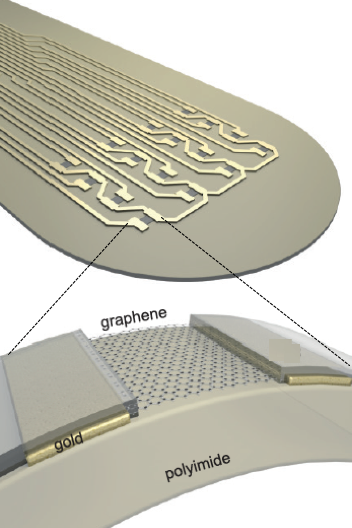 The flexible array of graphene SGFETs allows mapping brain electrical activity with excellent signal-to-noise ratio (SNR), suggesting that this technology could lay the foundation for a future generation of in vivo recording implants.